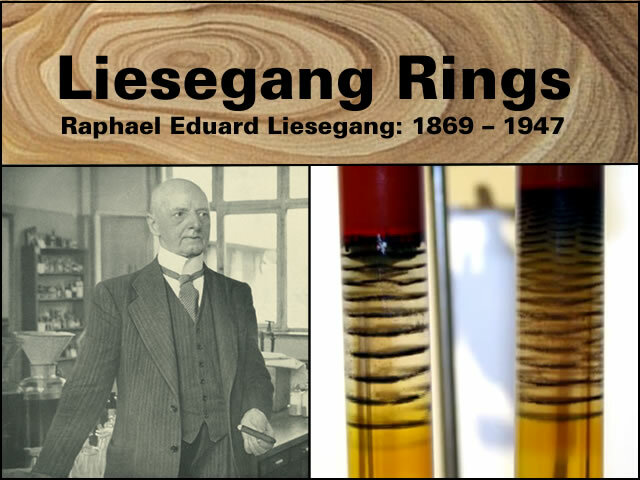 Raphael Eduard Liesegang was a remarkable man who pioneered the study of Liesegang Rings. Raphael Eduard Liesegang (November 1, 1869 – November 13, 1947) was a German chemist, photographer and entrepreneur born in Elberfeld. He is known for his work on Liesegang rings. He also helped develop the methods of capillary analysis, a precursor to paper chromatography, published a paper on the possibility of television (years before the discovery of the electron), contributed to chromosome theory, worked on properties of aerosols and gelatins, the origins of silicosis, the role of carbon dioxide in plant life and the mechanism of both black and white and colour photographic processes. The son of a painter (then later photographer), Liesegang longed for an artistic career but lacked the ability to draw or paint. His father would later invent a camera and photography would go on to be one of Liesegangs passions. Liesegang Rings are observed in chemical systems undergoing a precipitation reaction. Liesegang Rings are a phenomenon seen in many, if not most, chemical systems undergoing a precipitation reaction, under certain conditions of concentration and in the absence of convection. Such kind of chemical patterning was first mentioned in 1855 by Frederic Ferdinand Runge. As a reaction medium he has used simple filter-paper wet by an electrolyte solution. He called his patterns “self-painting pictures”, and published a whole book about them. Nowadays we use the term “self-organisation” for general designation of such phenomena, and probably thousands of articles can be found in the literature about it. But Runge’s discovery was unfortunately too early. Nobody respected his work, and precipitate patterns have fallen into oblivion until 1896. In that year Raphael Eduard Liesegang a German photographer and chemist was experimenting with gelatine layers swollen by solution of potassium-dichromate. 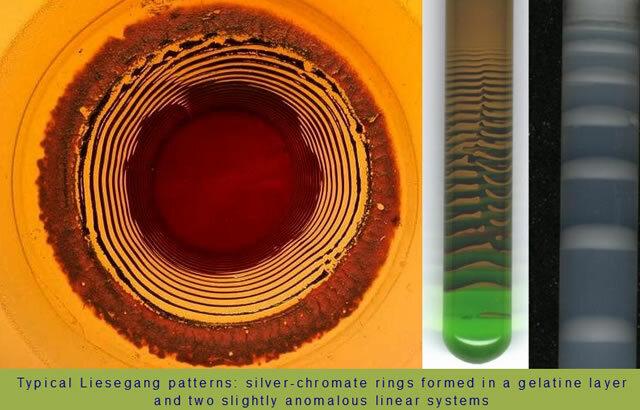 He accidentally dropped a small crystal of silver-nitrate onto a specimen, and was astonished that the precipitate formed concentric rings about it. Distances between adjacent rings were always increasing outward, and it was possible to reproduce the phenomenon with a one dimensional arrangement in a test tube too. Although Liesegang Rings are usually demonstrated using a gelling agent [such as gelatine] they also occur in solid and gaseous chemical systems. After the gelation process completed, a second solution usually at substantially higher concentration is poured onto the top of the gel. If the two electrolytes react with each other and form a weakly soluble material (precipitate), a series of precipitate zones will form in the gel matrix. Certainly there are many appropriate eletrolyte pairs, however there are some systems that produce Liesegang patterns more easily. Using chemically crosslinked poly-vinyl-alcohol gel the inner electrolyte can be for example magnesium-sulphate, while the outer one concentrated ammonium-hydroxide. These will form white magnesium-hidroxide precipitate. Liesegang experiments can be performed in two essentially different arrangements. One can use a simple test tube in which case the precipitate will form bands perpendicularly to the direction of diffusion. However, a similar pattern can be produced, if we use a gel sheet. Such a sheet can be produced if we pour the viscous solution of the gelling material onto a glass plate. In this case after the gel set, we put a drop of concentrated solution of the outer electrolyte onto the surface of the gel sheet. A “more sophisticated” method is if we cut a cylindrical hole into the sheet and use this as the container of the invading electrolyte. In this case the precipitate will form rings around the droplet or hole. Liesegang himself has performed such a two dimensional experiment in 1896. Maybe it is important to mention that some workers have found similar patterning in the absence of any gel like material. Precipitate zones can be formed for example in capillary tubes in pure water, or in gas phase, when HCl and NH3 diffuses into each other in a porous media (silica or active carbon). Because of these findings, it has been widely accepted that the role of the gel is only to prevent sedimentation of the precipitate, and convection of the electrolytes. 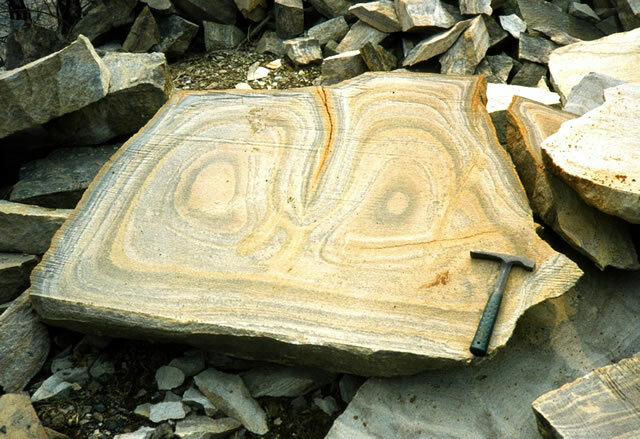 Most systems will form rings in the absence of the gelling system if the experiment is carried out in a capillary, where convection does not disturb their formation. In fact, the system does not have to even be liquid. A tube plugged with cotton with a little ammonium hydroxide at one end, and a solution of hydrochloric acid at the other will show rings of deposited ammonium chloride where the two gases meet, if the conditions are chosen correctly. Ring formation has also been observed in solid glasses containing a reducible species. A wonderful video by Felipe Moreno Romero clearly demonstrates how to experimentally produce Liesegang Rings and concludes with a remarkable time-lapse sequence [starting at 3:55]. The next post will review Liesegang Spirals, Helices and Polygons. Gallery | This entry was posted in Astrophysics, Liesegang Rings, Science, Solar System. Bookmark the permalink.